Obese children and teens are much more likely to become obese adults. Nearly 1 in 3 children in America is overweight or obese. And 1 in 3 children born in 2000 or later will suffer from diabetes at some point in their lives. Others will face chronic obesity-related health problems like heart disease, high blood pressure, cancer, and asthma. Overweight children are also at increased risk for emotional and social problems. Children today may even be on track to have a shorter lifespan than their parents. Helping your kids be physically active can prevent weight problems from developing or getting worse. Make physical activity a part of your family’s daily life. Walk to school together, take the dog for a walk, go for a bike ride, or play catch together. Create opportunities for your child or teen to be active for 60 minutes every day. Sports teams are a great way to make sure they’re getting regular exercise. Kids and teens are naturally active, but they often spend hours in front of televisions and computers. Limit TV and video games to less than 2 hours a day, and keep the TV out of your child’s bedroom. Experts recommend no screen time for children under 3. Get tips for reducing screen time. Remember that even a little physical activity can make a big difference in your child’s weight and health over time. Make sure your child gets at least 7 hours of sleep a night. Kids need lots of sleep to stay active and regulate hunger. Show your love and acceptance no matter what your child’s shape or size. Try not to single out an overweight child. Avoid words like “skinny” and “fat” or teasing children about weight. 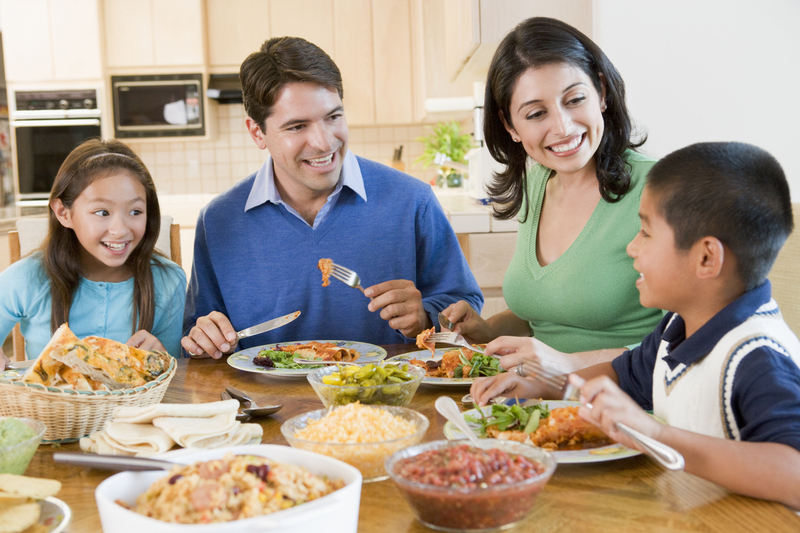 Eat meals together at the table, and keep the TV off during mealtimes. Give water to your thirsty little athletes instead of soda or sports drinks. Help kids avoid junk food cravings by keeping it out of the house and limiting processed and fast foods. If you’re pregnant, plan on breastfeeding your baby. Studies show breastfed babies are at a lower risk of being overweight later in life. You are responsible for what, where, and when your child eats. But let your child decide how much to eat. This allows children to tune into their own appetites and learn to stop eating when they feel full. Children don’t need to eat as much as adults. Avoid the temptation to make kids “clean their plates” before leaving the table. After age 2, limit saturated fats (such as whole milk, cheese, ice cream, and hot dogs) in your child’s diet. Encourage children to try healthy foods. Don’t give up if your child doesn’t like a particular food. It takes 8 to 10 times tasting a new food before a child should decide if he or she likes it. Treats like fast food, chips, candy, and cookies are okay from time to time, but not as part of your child’s daily diet. If healthy lunches and snacks are not provided at your child’s school or day care, pack nutritious foods for them. Letting children participate in preparing their own lunches teaches them to make wise food choices. Avoid soda, sports and caffeinated energy drinks, juice, and sweetened drinks. Choose healthy beverages instead. Make fruits and vegetables available at every meal. Try to serve meals where fruits and vegetables cover half of your child’s plate.Find new ways to add in fruits and veggies. Offer nutritious meals and healthy snacks in age-appropriate portions. Plan for a meal or snack every 4 to 5 hours but not more than every 2 hours. Know what your childcare providers are feeding your children. Play a part in planning a healthy menu, if possible. The teenage years can put a lot of pressure on your family. Issues of weight and body image and the natural changes your child goes through can be hard on both you and your teen. Keeping healthy foods in the house and teaching your teen about eating well can help ensure he or she is also picking smart food options away from home. Hand over some meal planning duties, or let your teen decide on family activities that get everyone moving. This Pacific Beach retailer and cooking school has been inspiring chefs of all ages since 1977. From teaching your little ones how to make their very own Green Eggs and Ham, to finding the perfect way to celebrate Mother’s Day, you will treasure the memories created during their classes. Their popular cooking classes for kids fill up fast, so be sure to sign up when you find your perfect pairing. Secret Ingredient: Since Great News is also a cookware retailer, you can pick up some fun gadgets to continue the cooking lessons at home. Join us for the 5th Annual SoNo Fest & Chili Cook-Off. This year also marks the 18th Annual San Diego Ceramic Connection Chili Cook-Off. This event that will bring together North Park and South Park for the holidays – there will be no more bickering about which community has this or which area is cooler – simply good, clean family fun that everyone will enjoy. We’ll have chili in hand-spun ceramic bowls, great holiday gifts and crafts from local artisans, live music, a kids’ activity zone with free cookie decorating, a craft beer and wine garden and more. Our chili cook-off will once again feature great local restaurants from North Park and South Park, as well as chili from local residents entering in the community cook-off! Not only is there great chili, but it’s served in unique, handmade ceramic bowls made by San Diego Ceramic Connection. $20 per bowl gets you the bowl and 5 chili tastings from some of the 40 best restaurants in North and South Park plus a few other areas (see participating restaurants below)! Join us in the Beer Garden from 11:00 AM to 5:00 PM. The perfect spot to watch your favorite band, eat some chili or hang with friends. We’ll be showing the Chargers football game as well. We will have 2 stages thanks to the generous sponsorship of The Casbah and Bar Pink. Each stage will headline local musicians throughout the day. Entertainers include: The Bed Breakers, Shawn Rohlf and the Buskers, The Nards, G Burns Jug Band, Unsteady, The Creepy Creeps, The Rosalyns, The Loons and Trailduster. (StatePoint) After weeks of yuletide indulgence, it’s time to think about New Year’s resolutions. Before jumping the gun on a regimen of deprivation, indulge one last time. 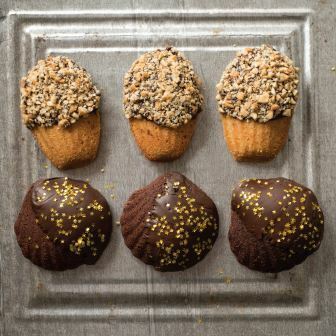 To make these dainty, distinctive treats at home, check out award-winning baker Barbara Feldman Morse’s new cookbook, “Madeleines: Elegant French Tea Cakes to Bake and Share,” featuring more than seventy recipes that use a simple one-bowl method. • Place a rack in the center of the oven and preheat to 325 degrees F. Coat two 12-shell pans with baking spray, or melt an additional 4 tablespoons butter and brush a little in each mold. • Let mixture cool for three to four minutes. Then add eggs, one at a time, whisking after each addition until completely blended. Add flour and cocoa, whisking thoroughly. The mixture should be very dark, thick and shiny. • Using a 1 1⁄2-inch-diameter scoop or teaspoon, fill shell molds with batter until almost full. Gently press batter to distribute evenly. • Bake for 10 to 13 minutes, until madeleines puff up and no shiny spots remain in centers. Small cracks may appear, but be careful not to over-bake. • Remove pans from oven and let cool on a wire rack for two to three minutes, then invert and tap madeleines onto the rack. Let cool completely. • Place chocolate in a 2-quart microwavable glass bowl or measuring cup. Microwave on low for one to two minutes. Stir with a whisk until smooth. If chocolate isn’t melted, microwave for 15-second intervals, stirring after each, until smooth. • Place waxed paper on a cookie sheet or large wire rack. Hold madeleines by their narrow ends and dip one-third in the warm chocolate glaze. Scrape the flat side along the side of the bowl to remove excess. Place on the waxed paper and let glaze set, 30 to 60 minutes. More information can be found at www.quirkbooks.com/book/madeleines.